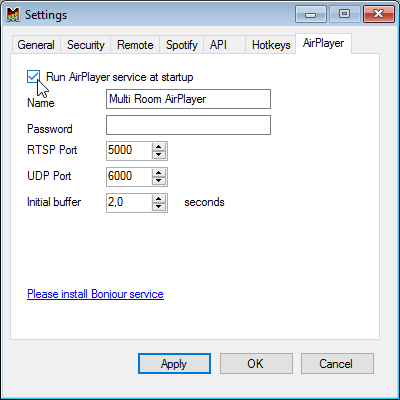 Run Multi Room Audio Player and open AirPlayer settings window. Here you can change broadcasted name, set password, change ports and audio buffering time. 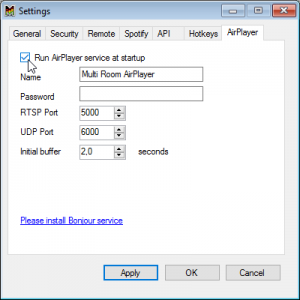 Please enable “Run AirPlayer service at startup” check check box and restart application. 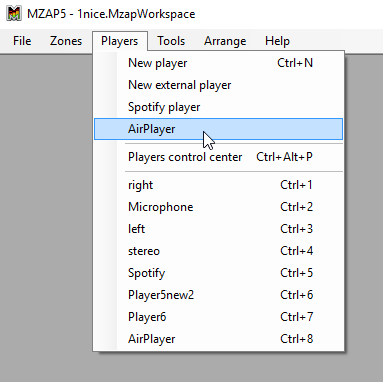 Then open AirPlayer window and select zones to play. 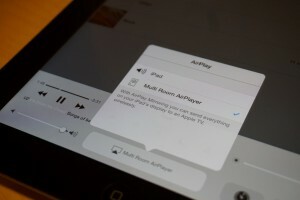 Connect your iOS device and PC with Multi Room Audio Player installed to the same Wi-Fi network. On your iOS device, swipe up from the bottom of your screen to open Control Center and tap AirPlay. Tap the name that you set in Multi Room Audio Player settings to stream your music content to. Now you can control audio playback from your iPod, iPad or iPhone device and even change volume remotely. In Multi Room Audio Player you can control audio stream using Player buttons and change zones on the fly. Enjoy your music! What about MyAudioStream audio application for iPhone and iPod. A nice music player and audio streamer to playback or beam music that you have stored on PC, MAC any UPnP/DLNA server wirelessly and transfer to any wireless speakers, AV receivers. I have at home PC with Serviio installed, like a server and stream the songs to my device from there wirelessly.